Acrokeratosis paraneoplastica is a rare acral psoriasiform dermatosis associated with internal malignancy, most frequently squamous cell carcinoma (SCC) of the upper aerodigestive tract. The syndrome of acrokeratosis paraneoplastica typically precedes the diagnosis of malignancy. Acrokeratosis paraneoplastica evolves through 3 stages, which are discussed more under in History. Note the images below. Acrokeratosis paraneoplastica. A 67-year-old woman presented with scaly plaques of the hands, feet, ears, and nose associated with esophageal squamous cell carcinoma. The eruption resolved with resection of the cancer. Image courtesy of Ronald Grimwood, MD. The term Bazex syndrome describes 2 different entities, both described by Bazex and colleagues: (1) acrokeratosis paraneoplastica and (2) the genetic syndrome of basal cell carcinomas, follicular atrophoderma, hypotrichosis, and disorders of sweating. Note the images below. Bazex syndrome. Acquired palmar keratoderma in a woman with a history of breast cancer and recent primary lung cancer. Courtesy of Jeffrey J. Meffert, MD. Bazex syndrome. 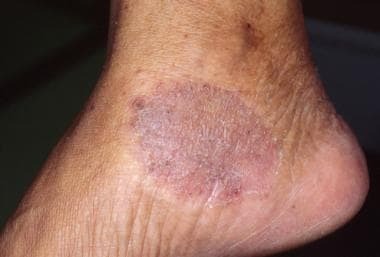 Violaceous psoriasiform dermatitis on the ankles. Lung cancer appeared to be in remission; both keratoderma and psoriasiform plaques resolved quickly with clobetasol ointment. Courtesy of Jeffrey J. Meffert, MD. Taher M, Grewal P, Gunn B, Tonkin K, Lauzon G. Acrokeratosis paraneoplastica (Bazex syndrome) presenting in a patient with metastatic breast carcinoma: possible etiologic role of zinc. J Cutan Med Surg. 2007 Mar-Apr. 11(2):78-83. [Medline]. Rodrigues IA Jr, Gresta LT, Cruz RC, Carvalho GG, Moreira MH. Bazex syndrome. An Bras Dermatol. 2013 Nov-Dec. 88(6 Suppl 1):209-11. [Medline]. [Full Text]. Karabulut AA, Sahin S, Sahin M, Eksioglu M, Ustün H. Paraneoplastic acrokeratosis of Bazex (Bazex's syndrome): report of a female case associated with cholangiocarcinoma and review of the published work. J Dermatol. 2006 Dec. 33(12):850-4. [Medline]. Valdivielso M, Longo I, Suarez R, Huerta M, Lazaro P. Acrokeratosis paraneoplastica: Bazex syndrome. J Eur Acad Dermatol Venereol. 2005 May. 19(3):340-4. [Medline]. Crucitti A, Feliciani C, Grossi U, La Greca A, Porziella V, Giustacchini P. Paraneoplastic acrokeratosis (bazex syndrome) in lung cancer. J Clin Oncol. 2009 Dec 20. 27(36):e266-8. [Medline]. Ljubenovic MS, Ljubenovic DB, Binic II, Jankovic AS, Jovanovic DL. 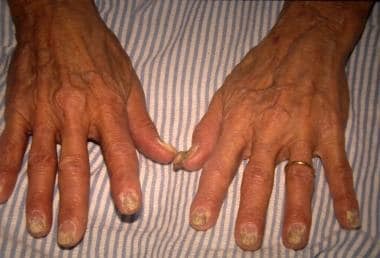 Acrokeratosis paraneoplastica (Bazex syndrome). Indian J Dermatol Venereol Leprol. 2009 May-Jun. 75(3):329. [Medline]. Squires B, Daveluy SD, Joiner MC, Hurst N, Bishop M, Miller SR. Acrokeratosis Paraneoplastica Associated with Cervical Squamous Cell Carcinoma. Case Rep Dermatol Med. 2016. 2016:7137691. [Medline]. Vatandoust S, McKay BP, McLeay W, Miliauskas J, Gordon L, Wesley JA, et al. Acrokeratosis paraneoplastica (Bazex syndrome) associated with metastatic cutaneous squamous cell carcinoma. Intern Med J. 2016 Jan. 46 (1):119-20. [Medline]. Lau SY, Khow KS, Yong TY. Medical image. Acrokeratosis paraneoplastica with in-situ squamous cell carcinoma. N Z Med J. 2014 Feb 14. 127(1389):86-7. [Medline]. Sator PG, Breier F, Gschnait F. Acrokeratosis paraneoplastica (Bazex's syndrome): association with liposarcoma. J Am Acad Dermatol. 2006 Dec. 55(6):1103-5. [Medline]. Chave TA, Bamford WM, Harman KE. Acrokeratosis paraneoplastica associated with recurrent metastatic thymic carcinoma. Clin Exp Dermatol. 2004 Jul. 29(4):430-2. [Medline]. Ali M, Keir M, Dodd H, Cerio R. Flexural Bazex syndrome associated with tonsillar adenocarcinoma. J Drugs Dermatol. 2004 Sep-Oct. 3(5):557-9. [Medline]. Lorette G, Samimi M. [Hands cutaneous exam]. Presse Med. 2013 Dec. 42(12):1582-95. [Medline]. Santos-Silva AR, Correa MB, Vargas PA, Almeida OP, Lopes MA. Bazex syndrome (acrokeratosis paraneoplastica) diagnosed in a patient with oral persistent ulcerations. Head Neck Pathol. 2010 Dec. 4(4):312-7. [Medline]. [Full Text]. Protopsaltis I, Drossou A, Katsantonis I, Roussos N, Manoludaki K, Arvanitis M, et al. Breast cancer presenting as paraneoplastic erythroderma: an extremely rare case. Case Rep Med. 2014. 2014:351065. [Medline]. [Full Text]. Chapireau D, Adlam D, Cameron M, Thompson M. Paraneoplastic syndromes in patients with primary oral cancers: a systematic review. Br J Oral Maxillofac Surg. 2010 Jul. 48(5):338-44. [Medline]. da Rosa AC, Pinto GM, Bortoluzzi JS, Duquia RP, de Almeida HL Jr. Three simultaneous paraneoplastic manifestations (ichthyosis acquisita, Bazex syndrome, and Leser-Trélat sign) with prostate adenocarcinoma. J Am Acad Dermatol. 2009 Sep. 61(3):538-40. [Medline]. Humphrey SR, Hussain AS, Chandran R, Wilson B, George B. 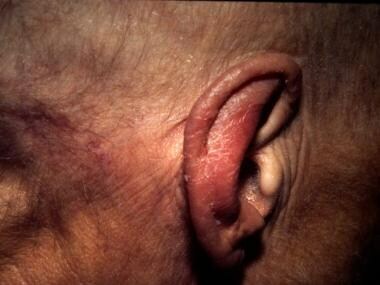 Acute Onset of Acrokeratosis Paraneoplastica (Bazex Syndrome). JAMA Dermatol. 2015 Jun. 151 (6):677-8. [Medline]. Cabanillas M, Perez-Perez L, Sanchez-Aguilar D, Fernandez-Redondo V, Toribio J. [Acrokeratosis paraneoplastica with bullous lesions associated with esophageal squamous cell carcinoma]. Actas Dermosifiliogr. 2006 Apr. 97(3):196-9. [Medline]. Fasanmade A, Farrell K, Perkins CS. Bazex syndrome (acrokeratosis paraneoplastica): persistence of cutaneous lesions after successful treatment of an associated oropharyngeal neoplasm. Br J Oral Maxillofac Surg. 2009 Mar. 47(2):138-9. [Medline]. Medenica L, Gajic-Veljic M, Skiljevic D, Pesko P. Acrokeratosis paraneoplastica Bazex syndrome associated with esophageal squamocellular carcinoma. Vojnosanit Pregl. 2008 Jun. 65(6):485-7. [Medline]. At this power, a patchy lichenoid infiltrate of predominantly lymphocytes can be seen underneath an epidermis with psoriasiform hyperplasia and serum crust in the parakeratotic cornified layer (hematoxylin and eosin, 100X). Focal vacuolar interface change is seen with associated pigment incontinence and exocytosis of lymphocytes (hematoxylin and eosin, 200X).